So, radioactive facials were a thing. If you fall far enough down the rabbit hole of Youtube, you’ll find collections of vintage beauty tutorials that are equally entertaining and fascinating. There are bits of the videos that are charming (baking and contouring were around in the ’40s), and parts that are downright terrifying (radioactive facials). Here, we rounded up our favorite old school tutorials for your viewing pleasure. This tutorial from the 1940s teaches women everything they need to know about cleansing their skin, applying makeup, and choosing a hairstyle for their face shape. Pretty basic stuff, right? Oh, but there are some hidden gems in here (like the fact that instructor is orating from what appears to be a high school auditorium). The good: According to the woman in the video, colleges once offered courses on female grooming. One whole class was dedicated to cleaning your face. If this existed today, we would have a PhD in Korean double cleansing with a minor in Clarisonic studies. The bad: The instructor has plenty of rules regarding rouge—known today as blush. Apparently, we’re all supposed to match our blush to our lipstick and nails. Oh, and check the coloring of our outfits to ensure it really feels cohesive. No thank you. This fascinating video from the 1960s feels almost like a modern day beauty tutorial. 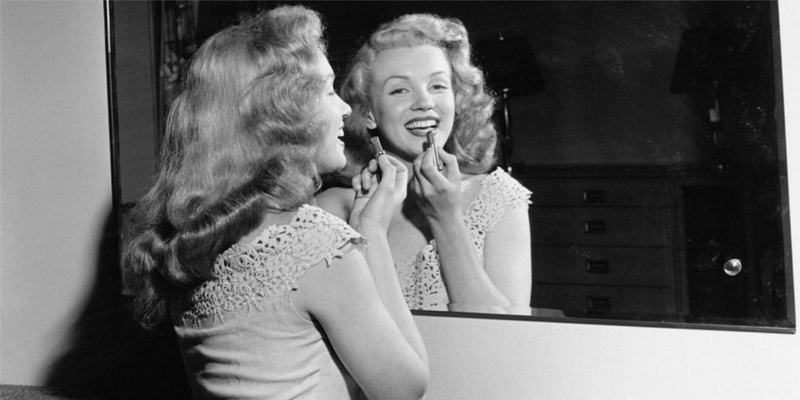 We follow the woman from start-to-finish as she powders her face and applies lipstick. The good: Could this be the very first mention of contouring on video? Who knew! They didn’t have our modern array of contouring products, so she uses a darker blush instead. Also, there is a cute dog in this video. For reasons we do not know. The bad: The narrator mentions something called “disturbed skin,” and reccomends using medicated foundation should you have it. Does she mean blemished skin? Red skin? Other than being quite literally possessed by a demon, we have no idea what disturbed skin means. Where do we even start with this horrifying vintage facial tutorial? Okay, first go watch it—then come back so we can discuss. The bad: Oh my god, they just irradiated her face. Her face has been nuked. We can’t get past this. But what might be even worse is this line: “Here, they’re practicing on a fellow student from Siam who’s discovering just what gives Western complexions their zip.” The answer? Just a radioactive facial. No biggie. There’s something deeply unsettling about a guy mansplaining the best female hair removal methods. He also decides to throw some nail polish removing tips in here, just for fun. The good: The narrator correctly explains that shaving will not make your hair grow back thicker or darker. He also points out that chemical hair removers can irritate skin, which we all know to be true. The bad: “Nail polish is harmless, but you should remove it for short periods to prevent cracking of the fingernails,” says the narrator, who clearly didn’t know about the presence of formaldehyde, toluene, or DBP in old nail polish formulas. Watch as a makeup artist and narrator demonstrate makeup 101: how to apply foundation, powder, mascara, and lipstick. The good: Even women back then knew the benefit of baking your face powder to set your base makeup. Some things never change. The bad: The narrator tells us to wait five minutes before blotting our lipstick down. And then cover it with a layer of powder, with no explanation at all. We’re guessing it’s because lipsticks weren’t as long-lasting back then, but damn, that seems like a lot of work. Watch as a narrator explains how black hair was chemically straightened back in the day—with some snarky comments along the way. The good: It’s pretty cool to see how this process was done in the past. The chemical straightening took two hours and involved a “secret” blend of oils and hot combs. The bad: I could really go without the narrators commentary on how most women want curly hair, but black women want to change their natural texture. “Do they like it? They’re women, aren’t they?” he quips. Not cool, dude. This is just a short video of a woman brushing her hair. Nothing more, nothing less. The good: There is something oddly soothing about watching people brush their hair. The bad: Contrary to that the narrator says, “100 strokes a day” doesn’t make “your hair more attractive.” It just makes your hair brushed. This is quite possibly the first beauty video starring a beauty editor. Who knew we even existed in 1938? The good: Brow trends have changed so much over the years, but there’s something so refreshing about a super-skinny brow. We’re almost tempted to pluck ours again (Cara Delevingne, give us strength). It’s also nice to see a video inclusive of women over 40 years-old. The bad: Judge-y much? This tutorial makes several sweeping generalizations, such as dark-rimmed glasses being too “severe,” and that lips can become “permanently attractive” with a swipe of lipstick. The house marks its third participation in the world’s biggest sporting event with three new projects. From feathers to every shade of pink, these looks won the red carpet.